Instead of complaining, as some people would do, she said, “thank you,” and accepted it. Only after the cake caused a small scene by other employees at the cash register was it explained that the worker is autistic. This story was posted by that mom on her Facebook page as a simple reminder that “kindness is important.” As the parent of an autistic child, I agree, and I’m glad she shared it. But as her post has gone viral, the debate has also spread. Is this mom patting herself on the back? Was the reaction of the fellow employees disrespectful to the autistic worker? Was it an invasion of the worker’s privacy? 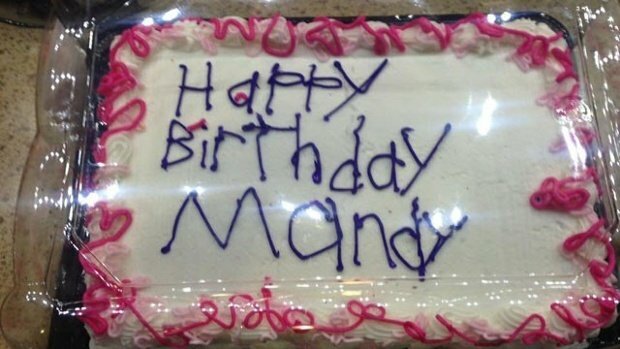 Is sloppy cake-writing even a symptom of autism? Nationwide, there is a growing number of children diagnosed with some form of autism, which means that there will soon be a much more significant amount of autistic adults working with us, or maybe even above us, or rubbing shoulders with us in the produce aisle. So the time needs to come when this story of tolerance is so commonplace that no one will feel compelled to share it. It needs to be unexceptional. It needs to be typical. In order to get there, perhaps posts like these are a step in the right direction. How else do we make the exceptional less so? When anecdotes of kindness, flexibility, and tolerance become so numerous that they are no longer special, then I might find them off-putting or self-congratulatory. But until then, I am happy to hear them.